I'm mentally prepared to be trolled, derided and umm... maybe ostracized even. But I need to say what I need to say. Kabhi Kabhie is Yash Chopra's most overrated film ever. Period. neighbour. After the sundry exchanges about child tantrums, daily chores and the usual agonies of life in Modi's India, I quickly asked her whether she loves romances of the Yash Chopra kind. She started with a gushing take on Dilwale Dulhania Le Jayenge and how it was her go-to film even a few years back. On correcting that the film was actually not Yash but his son's Aditya's directorial debut and perhaps his only watchable film, she revealed that it might not be as appealing today as it was earlier. Why? Because, as she put it, "Times were different then. We were different. I cannot relate to it anymore." This was my chance, my ticket to launch a tirade against a film over which I wasted three hours the previous night. Now why I did not abandon it midway? You see. I don't give up that easily. I'm a movie freak. I immediately retorted, "I don't know whether I wasn't able relate to the times or the emotions but Kabhi Kabhie (1976) was utterly disappointing!" A raised right brow and a momentary roll of eyes later, Bhumika chuckled and said, "You are trashing a very famous film! You must be really pissed with it!" Oh yes, I was. And here's why. Frankly, I fell for it because of the cast. Amitabh Bachchan might not be a compelling enough for me to choose a film but I'm immensely fond of Shashi Kapoor, Waheeda Rehman and Rishi Kapoor. I love Neetu Singh's infectious energy and effortless charm. I absolutely revere Sahir Ludhianvi's poetry. 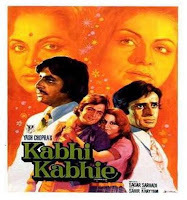 For the uninitiated here a gist of the long, winding tale... Bachchan plays a popular poet, Amit, who after a recital session in Kashmir meets Pooja (Rakhee), a pretty young thing who is smitten by his charisma and couplets. The two soon hit it off and is seen serenading in the breathtaking valleys. The clothes of the lovers bear ample proof that both are well off and hence there isn't any concern for separation owing to class divide. However, when Amit implores Pooja to promise him that she would always be by him, she favours the 'abla nari' trope and says she really would be helpless before the desires and decisions of her parents. I press my first irk button here. Woman... seriously? If you love, you got to have conviction in your love. If you are unsure, just say so and don't keep the boy hanging. extremely confused about what she wants she asks Amit for a solution. Amit, the self-respecting poet that he is, turns out to be even more wavering in his mind than Pooja. He asks her to get married to the boy daddy's got for her. Like, really? So why were you singing paeans to her beauty and professing undying love to her if you do not have the courage to go tell her father that you love her and want to marry her. Maybe, he could have assured him of his own daddy's money and won the case! Now, those who fell for Chopra's bait might say that because Pooja was so unsure of her love and decision, Amit feels hurt and parts with her. But my point is... isn't it a lover's responsibility to show his partner the way out in times of trouble? I felt both were such escapists. So much for wasting time on the pristine valleys of Kashmir. Pooja gets married to this robust character called Vijay and settles in into domesticity royally. In her heart of heart she pines for the dulcet appreciation showered on her and her beauty by Amit, but she also recognises the good soul that her husband is and zooms into his arms without much ado. Why I say this? There is a point much later where in a tender moment she beseeches Vijay to praise her beauty expecting that he will recite a sweet couplet or two. When he unabashedly mouths how much he loves her without mincing words and without garbing it in poetry, she fathoms that Vijay is all heart-on-the-sleeves and no poet. I wonder why she keeps hanging on to Amit's memories when Vijay is such a fantastic man who loves her with all his heart. Agreed that a woman never forgets her first love. But when that lover failed you miserably you aught to forget but never forgive him. Hurt and dejected, Amit leaves the pen and takes up his father's business, whatever that is. He even gets married to Anjali (what a waste of the phenomenally talented Waheeda Rehman). They have a daughter, played by someone really inconsequential. Vijay and Pooja's son grow up to be the dashing and dishy Vikram (Rishi Kapoor), who sweeps Pinky (Neetu Singh) off her feet. Young hearts in the throes of love, they sing some very average songs while on an outing in Kashmir, only to return to Delhi so that they can tell their parents about each other. Everything is going fine so far. It appears that both the families are close to each other and there is nothing that will balk in the way of their union. But. Pinky's parents (played by Parikshit Sahni and Simi Garewal) are hiding a secret from their daughter about her real identity. Pooja, for some weird reason, persuade them to reveal the reality to Pinky, despite they feeling jittery about the repercussions. Pinky is obviously devastated to learn that she is an adopted child. The film just spirals down from here. to reach out to her biological mother and demand her rights. Like, really? What about the love and care of the ones who brought you up? Are they no one anymore? And why distance yourself away from Vikram who holds no grudge against you. She keeps saying that now she feels that whatever her parents are doing for her seem like a favour but seriously that appears stretched. So, Pinky leaves for Kashmir and locates her mother, who happens to be Anjali, who recognises her but is forced to feign ignorance for fear of her husband. Both hide the truth from Amit, though he is quite intrigued with the undue attention Anjali pays to Pinky. Fair enough. Anjali's maternal instincts are heightened for the daughter who she had to abdicate. Her love surges out when she meets her after such a long time. But what I cannot understand is why there is no show down between the mother and the daughter in isolation so that we are saved all the unnecessary dithering and delaying in the denouement. What is Pinky and Anjali waiting for? They could have easily talked, hugged and settled the matter long before they actually do. And Pinky could have left for home in Delhi. Chopra just elongates the whole process. Vikram follows Pinky to Kashmir but for some strange reason cosies up to Amit and Anjali's daughter, who is quite headstrong and spoilt. He wants to be near Pinky but she keeps her distance. Don't ask me why. She even suspects him to be cheating on her with his new object of affection. Everything seems so befuddled in the plot. Or was there a plot anymore. Soon, Vijay and Pooja come over to Kashmir to meet Amit and Anjali and yet again we see the traces of Amit and Pooja's regrets of what they could not decide upon years back. Seriously, their emotions and the cause of it all seem so tiring after a point. Amit is clearly still in love with Pooja. Which means, he could never give his all to Anjali. So what gives him the right to fire her for her indiscretion years back. If he has not been able to move on, maybe he should just ignore her past. Because clearly he has not been emotionally faithful to her after marriage. Amit and Anjali's relationship is rather vague and Waheeda Rehman even looks unconvinced as she mouths Anjali's dialogues. An actor of her calibre deserves a much more fleshed out character and finer nuances. Anjali is uni-dimensional and sad. As it is with love stories, things are all sorted in the end but it takes such a long circuitous route that my patience is tested. I would never recommend this film to anyone. Never. I found it to be jaded and such a failure. Rishi Kapoor, wasted. Neetu Singh, wasted! pretty in her saris. She's a simple beauty with not much fanfare. Her makeup is light and the camera plays with her hazel eyes and her long mane. The script and camera accentuate her charm to an elegant and graceful level. But that's about it. She is a docile and sweet person with no gravity in character. I found her persona rather flawed, taking recourse to unclear and muddy thoughts without much clarification. I have always believed her to be quite average in the looks department (it's completely my opinion) but a darn good performer. That's why I felt so let down. She should have chosen a better part for a comeback after her marriage to Gulzar. Rakhee's much more than this tepid Pooja. @Madhu... See this is what I meant... It's just not that kind of film you would want to watch when you are in a vacant or musing mood... It's lacks the sublimity of an Ijaazat or an Mere Mehboob... Tell me... Is Silsila better or will I again be crestfallen? Well, you will hate it because the female characters are as strong as the ones in Kabhie Kabhie. Standing up for your love is so outlandish but indulging in extramarital affair is the real way, thats Silsila for you. Take out the songs and this movie is a flick. Though I have heard it was a box office disaster.